Someone can tell me to what is it due? well, you are apparently misusing the simGetObjectPosition function... my best guess is that the handle of the object you are trying to change the position is not proper... but without the code it s difficult to help you! Well, I am using a bridge to communicate between ROS and VREP and every quadrotor has a non-threaded child script. could you verify the value of quadrotor2Handle? with a print("quadrotor2Handle:",quadrotor2Handle) after line 92 of one of the scripts... 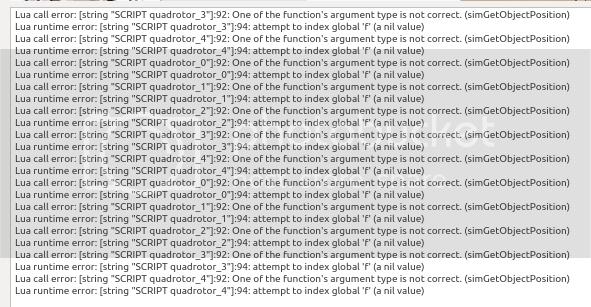 I m pretty sure it will be nil meaning that the object quadrotor_2 does not exists.